to use all these additional features, such as conditioned creating, sorting, splitting into multiple files, VBA execution, etc. This means that this free SlideFab 2 lite version will be a huge time saver for you. There is no need to use massive copy/paste anymore. No need to code your own Excel to Powerpoint macros. It is all there. Out of the box. At no cost. No matter in which industry you are or what corporate function you fulfill. No matter for which purpose you have need to create slides. With SlideFab 2 lite you can fabricate 'em. SlideFab 2 lite can be downloaded for free here. If the lite version becomes too small at some point in time, because there is a need to automate more than 2 shapes per slide, upgrading is easy. Just get a flex or saver license, enter the download key into the software, and there you go. 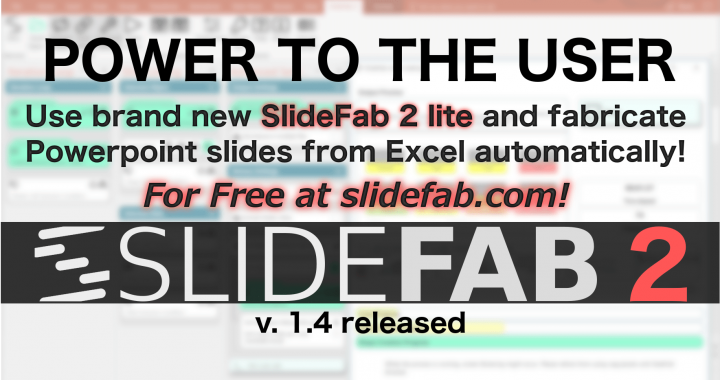 SlideFab 2 will be unleashed from its lite limitation. And what's best: You already know that it will be for working for you from the lite edition. Posted in New Version and tagged Excel, New Version, Powerpoint, SlideFab 2, Update.